As the blog will receive its millionth visitor today, I'm hosting a live chat party in the Party Room— the upper right hand side of the page — at 7 p.m. It's BYOB, but there will be music and conversation. Dress is casual. When automobiles first appeared on American roads, more than a century ago, they were considered unacceptably dangerous—too loud, too fast, apt to frighten the horses and run down pedestrians. Certain towns, in an attempt to minimize the hazard, enacted ordinances requiring that any horseless carriages traveling within city limits be preceded by a person holding a red flag, to warn of the approaching peril. Such laws were soon swept aside in our rush toward the future. 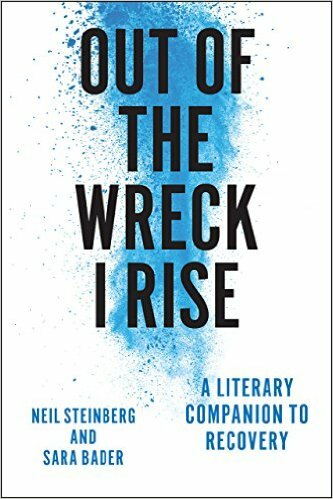 But knowing about them left a lingering notion of a red flag, as a safety device, as being quaint and antique, firmly ensconced in what the great James Thurber once called "the halls and parlors of the past." A way to express caution that is rarely found today, perhaps at the occasional construction site, or maybe on a lifeguard stand to convey beach conditions, or planted, probably due to some arcane law, at the end of an extra-wide trailer truck. We were heading for the Lakeshore Arts Festival in Evanston's Dawes Park early in August when I was stopped dead in my tracks, while scooting with my family across Sheridan Road at Clark Street, by this singular sign. I told them to go on without me and I'd catch up after I marveled at the wonder.. Under the sign, a cylinder to hold the flags. Empty, of course. There were no flags, though there used to be. A web site called "Legal Insurrection" posted this picture from a correspondent claiming they went up in 2012 as "a recent addition in a series of 'improvements' to this crossing where, to my knowledge, there has never been a mishap." 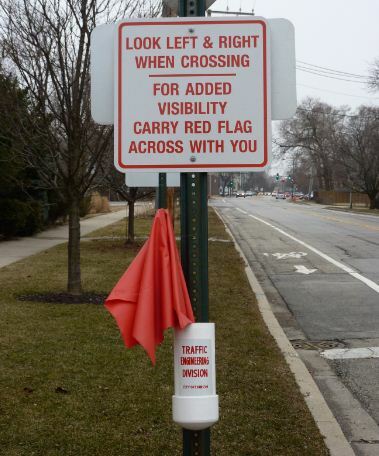 A little research tells us the flags were featured in the Pedestrian Safety Evaluation Report delivered at a special Evanston City Council meeting on Aug. 6, 2012, recommending the city "Place crossing flags at all of the park crossings to alert the drivers when pedestrians are crossing the street." About half a dozen intersections have them in Evanston, according to residents. Claire Zulkey, writing about the flags on the WBEZ blog, pointed out that pilferage by "hooligans" is a drawback to the system, though not the only one. There is also mockery. The Daily Northwestern noted that a budding NU comic ridiculed the flags during his routine though, in amateur journalist fashion, did not detail what was said. There is an exhausted carelessness to the flag idea, almost a kind of paradox: any crossing dangerous enough to require that pedestrians vigorously wave flags over their heads in an attempt to save their lives probably needs a stop sign or a streetlight, if not an overhead pedestrian bridge. The flag strategy smacks of cheapness and intellectual failure. It's something you would expect to see in North Korea, in lieu of expensive traffic lights. That said, the flag system is not without charm. I have never strode across a busy intersection madly waving a red flag over my head, but imagine the experience has a certain frisson, assuming you aren't run down by a truck in the process. 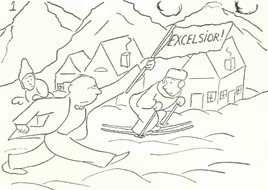 You really need the aforementioned James Thurber to convey the feeling, which he conveniently has already done, in his 1939 illustration of Henry Wadsworth Longfellow's chestnut "Excelsior." I left the intersection with conflicting emotions. One, that I wished I lived in a society where people wouldn't steal the flags—college students are prone to pranks, and a bucket of red flags is an invitation to midnight theft if ever there were. You'd like to think that even sophomores drunk on punch and grain alcohol would pause before undermining even this sadly inadequate, fragile, jury-rigged yet somehow quaint system of pedestrian safety, but obviously they don't. 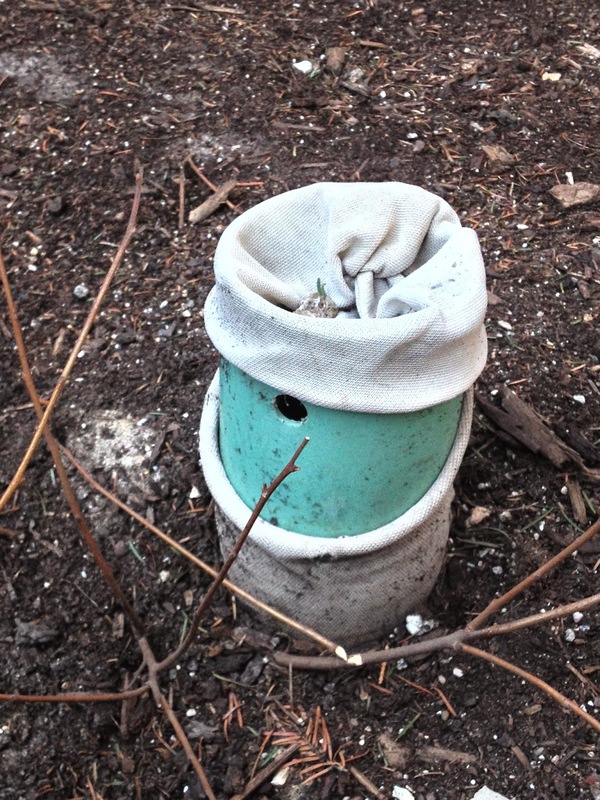 Two, Evanston should stock the white cylinders or remove them. I felt positively naked, crossing flagless. If the flags are necessary, keep them supplied. If not, take down the signs. Third, I know Evanston is a different sort of a town. But really, this is daft, a piece of performance art that somehow drifted into serious traffic management. It's something I'd expect to find in Oak Park. Berkeley Cal. tried this at least 10 years ago. Total failure & yes, all the flags were stolen in the Peoples Republic of Berserkeley.. Putting out those flags is an admission of the total failure of driver training, obeying stopping for pedestrians in marked crosswalks & the miserable police response to bad driving, especially the inability to end those who hold their phones & talk, but the texters are even worse!. It's simply appalling to be on Lake Shore Drive, going 55, like everyone else in a 45 zone & watching the moron next to you looking down while typing & sending a text! Dummies, you can have Siri or whatever Google's copy of it listen to you talk & then send it for you without looking at the phone. The phone will also read the texts to you! I know of a city where the red flags would have been set up because a politician's relative sells red flags. Not just Evanston. Highland Park has one of those signs/cylinders on the east side of the main train station. It's a way to signal clearly that you are in the crosswalk wanting to cross. Sometimes when one is driving it isn't totally apparent. Something that is very Oak Park is the way that at many intersections with lights, you have to press a button to get a Walk signal with the green. Thus if you come to the crossing after it has turned green, it will say Don't Walk, and you have no idea if you have 20 seconds or 2 seconds. I have no idea what the purpose is, other than a punitive finger wagging "If you wanted to cross, you should have been here and pressed the button." It seems antithetical to pedestrian safety. For a while, they took the buttons out at Oak Park and Lake, a major crossing, but they are back. Almost every suburb is like that. It's really ridiculous when you walk up to a corner just as the light turns green for you & the traffic & it still shows "Don't Walk". That is silly indeed about the flags. Good point about just putting up a red light. Didn't know Oak Park was that odd when you say that's where such a sign belongs. They don't call it the People's Republic of Oak Park for nothing. Still, overall, I think it's a pretty cool town. And what a waste of $ too. That's the local village hall for you. They actually tried the flag idea for a VERY short period of time at the Grace and Elston crossing by the Abbey Pub. I have also seen them at a busy street crossing to the beach in Treasure Island, Florida. I think they were pretty successful in Florida. We tried these in Park Ridge. Bet that Bitter Scribe would have a good retort for that sign. Come out wherever you are, Scribe. Learn the Spanish phrase no matame--"don't kill me." Run across the street hollering "No matame, no matame!" If you're lucky, the drivers will take pity on you. He was kidding. I think. Five years after the law kicked in requiring drivers to stop (not just yield, stop) for pedestrians in the crosswalk, it is still routinely flouted, or perhaps still has not steeped its way into public consciousness. Doubt a red flag would make a difference. I guess nobody's going to mention Chicago's efforts to get motorists to stop for pedestrians in crosswalks. Many no-stop-sign intersections in walkie neighborhoods have signs in the middle of the street informing drivers of the law that they must stop. To the tune of $500 a sign, natch. According to this Tribune article from last year, "Some 268 of the 344 signs have been replaced after being dinged or wiped out by vehicles..."
They put a couple such signs here on 63rd Street where there's a medical office on the Southeast corner of Kildare and the parking lot is on the North side of the street. One sign didn't even make it through the first day; the second disappeared shortly thereafter. On the other side of the coin, I've driven in Santa Monica where almost every intersection requires a stop for pedestrians and blew a whole lot of them in a short period of time, but fortunately managed to avoid actually running anybody over. Not much benefit to pedestrians, indeed. Since you can't assume cars are going to stop, or even slow down, I feel like I almost have to be more careful now. Although when I'm driving, I seem to constantly see pedestrians who step out without even looking to see if a car is coming. End of curmudgeonly rant. In a world of distracted, drunk and hurried drivers, we should all be waving white flags for surrender! Does anyone remember LeClaire st, (sp?) or Polk St. and CAlif ave, around Harrison or the Ike xpway? It was okay in the late 50's/early 60's. I had a great uncle who was a yellow cab driver in the 20's and 30's. He hated driving in the west side, because pedestrians were always stepping into traffic without looking. That area could use some red flags to cross and bullet proof vests. Rats! I'm too late to be number 1,000,000.
Who was the millionth poster? The counter tracks page views, not posted comments. As for the new pic on this page of the wall, that is a scary looking place to put a nice poster on. Those old bldg. basement windows are so creepy. Green Street Smoked Meats, 112 N. Green. If one ever gets in such a situation, he must start meeting attorneys and their staff. Take full advantage of asking questions, and find the right attorney for you. My friend works with a DUI attorney Los Angeles and let me know if I can help you. "A feast of joy, love, harmony and grace"
"The moving walkway is now ending; look down." In moments, trauma unit turns into "war zone"
The cucumber you just ate might kill you.